The city of Pavis is one of the most diverse and impressive colonies of the Empire of Wyrm's Friends, containing communities of elfs, dwarfs, dragonewts and several cultures of men. Its walls are made from the flesh of giants, its magic is strong and its founder is revered as a legendary hero. 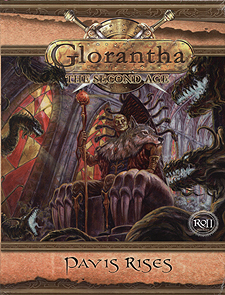 It is, in all respects, one of the greatest cities of Glorantha. It is about to be turned upside down. Pavis Rises is a collection of linked scenarios that frame the events that transform Pavis from bustling city of wonders to treacherous collection of ravaged streets and war torn peoples. It takes a group of unlikely Gloranthans from a chance meeting at the gates of the city all the way to creating their own place in the city's history.